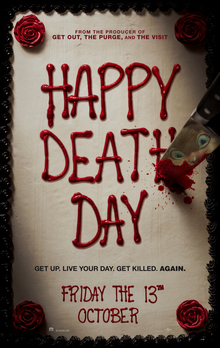 A horror film about a college student that's murdered on her birthday, and then keeps waking up the previous morning, having to repeat the same day until she can find out who her killer is and stop them. It was directed by Christopher B. Landon (who also helmed the 2015 zombie horror flick 'SCOUTS GUIDE TO THE ZOMBIE APOCALYPSE'), and it was written by Scott Lobdell. The film stars Jessica Rothe, Israel Broussard, Rachel Matthews and Ruby Modine. It's received mostly positive reviews from critics, and it's a huge hit at the Box Office as well. I absolutely loved it! Tree Gelbman (Rothe) is a very popular student at her school, who's having an affair with a married teacher and likes to party and drink a lot. She wakes up in the dorm room of a much less popular student than her, named Carter Davis (Broussard). Tree then rushes out of his room, embarrassed by what she's done, and goes about her day, which happens to be her birthday. Later that night she's murdered by a masked killer, and the next day she wakes up the previous morning, having to repeat the same day again. Tree discovers that she'll have to keep doing this, until she can learn the identity of her killer and stop them. There's been so many movies now that take a different spin on the 'GROUNDHOG DAY' storyline (like the equally excellent 'BEFORE I FALL', from earlier this year), that it seems like it should be it's own film genre by now!. This movie manages to do it in a pretty fresh and somewhat creative way though, and it's a hell of a lot of fun. Especially if you love horror flicks (like I do). Rothe is great in the lead, and Lobdell seems to be an awesomely talented director at this film genre. I can't wait to see what he does next, and I definitely recommend this movie as a Halloween treat!